These images are taken from the collection of example simulations included with Kinetiscope. Click on each thumbnail image for a full-scale view. This is a reaction scheme modeling the circadian rhythms of cyanobacteria, as described by N. Bentenitis in J. Chem. Ed. 85, 1146 (2008). 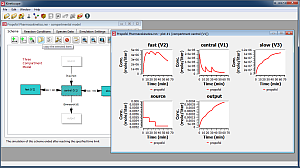 The list of reactions comprising the mechanism and a graph of simulation results are shown. 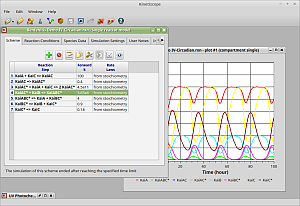 The image shows Kinetiscope running on Linux Mint. This reaction scheme simulates the redox chemistry of ferricyanide under conditions of a linearly varying voltage. 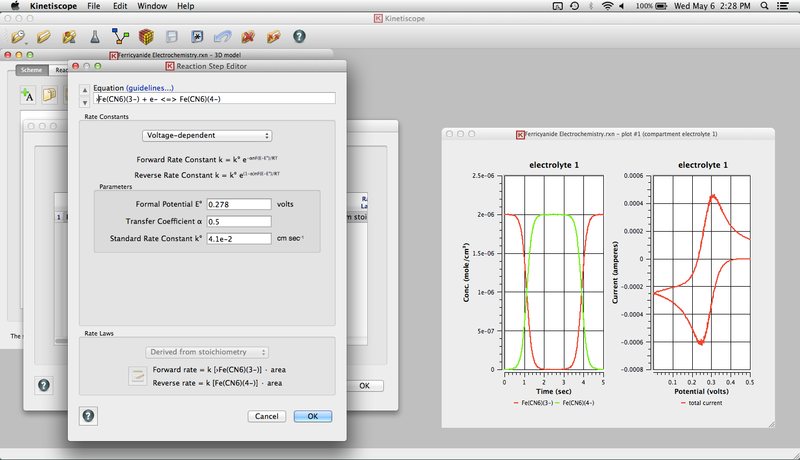 The Reaction Step Editor dialog window, and graphs of concentration versus time and current versus voltage are shown. 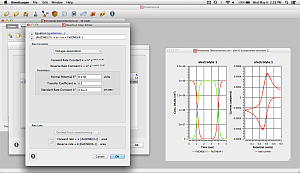 The image shows Kinetiscope running on Mac OS X. This three-dimensional reaction scheme is configured to calculate the evolution of the latent image in a thin polymeric photoresist film during post-exposure thermal processing. 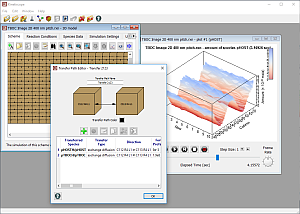 A Transfer Step Editor dialog window is shown along with a three-dimensional graph of the chemical state of the film at one point in the thermal process. The image shows Kinetiscope running on Microsoft Windows 10. 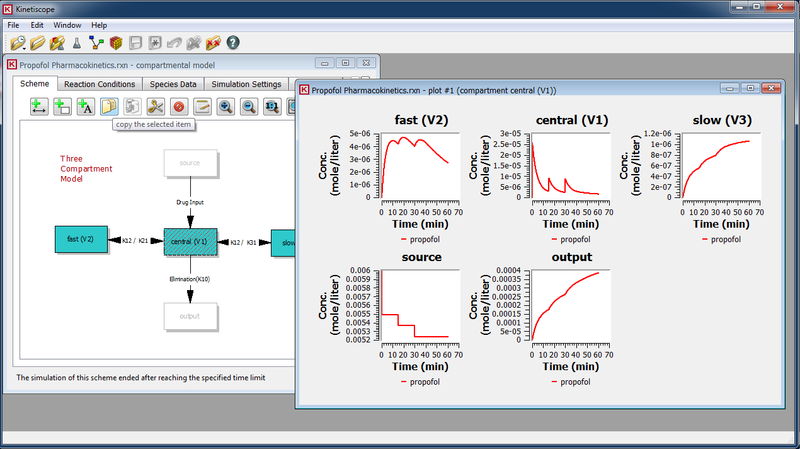 This reaction scheme simulates the pharmacokinetics of propofol, an intravenous anaesthetic. The reaction scheme employs a programmed external stimulus to administer the drug as series of bolus doses. 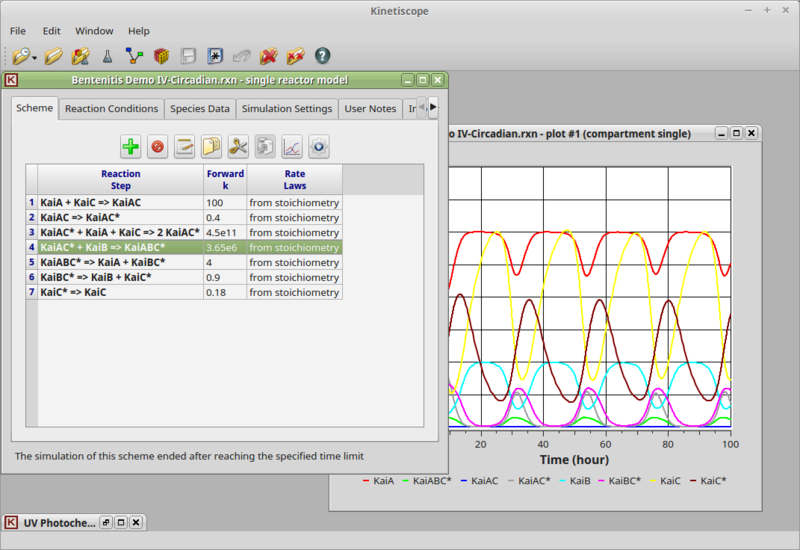 The image shows Kinetiscope running on Microsoft Windows 7.